This book came about by demand following the success of the exhibition in Worcester Cathedral last September. 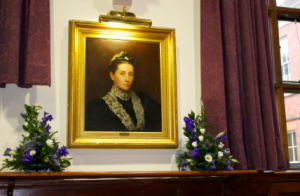 It was launched on June 22nd to coincide with the installation of the Blue Plaque to honour Alice Ottley, and the 130th anniversary of the opening of the school. The book charts the life and times of Miss Ottley prior to, and after becoming, Headmistress of Worcester High School for Girls, which would later be re-named in recognition of her achievements. Building expansion and academic successes bore witness to Alice Ottley’s foresight and capability, and such was the respect in which she was held that shops and businesses closed on the day of her funeral in Worcester Cathedral. This book encompasses topics previously uncovered in histories of the Alice Ottley School, and some of the pictures used can be seen in print for the first time. Copies can be obtained from RGS Reception price £6 (cheque payable to The Alice Ottleians & Old Elizabethans’ Association) if collected in person, or ordered and posted to a UK address for £7.50.